Having gone to all the trouble and effort to optimize your website content for the search engines, it's well worth the extra time and effort to track and measure your progress so you can more easily see what's working and what you might need to spend more time on with your SEO. Here are some of the best tools to track and measure your photography SEO. You’ve come a long way on this journey into the world of SEO, and you now have all of the basic tools and strategies you need to propel your photography website to the top of the local search results and, more importantly, keep it there. But how will you know how effectively it’s all working for you? No discussion about SEO would be complete without talking at least a little about how to track and measure your progress in the search results, since this is the only way to know for sure if you’re heading in the right direction. There are many tools and systems available for the website owner to track search engine rankings and monitor SEO, some of them free and others available for a premium, and your choice will depend on your budget and how much information you want in this area. Of course, being able to track and measure your progress is essential in order to ensure that your SEO efforts are producing positive results, and to identify those areas that might need further attention or improvement. The list of available tools is extensive, and constantly changing, so I advise you to research the latest options online before making a definitive choice of research or analysis tool, especially those related to tracking backlinks and search engine rankings. Some of the premium tools can become quite costly to use, but do come highly recommended. My personal favorite is the analytics and real-time tracking abilities of the Clicky tracking software (1st in the list). I’m sure there are plenty of others so if you find one you particularly like, do let me know and I’ll add it to the list. Google’s search console and webmaster tools have been around for a long time, and is one of those “must have” assets for anyone running and optimizing a website. By the way, if you prefer Bing, they also have their own set of webmaster tools, which work in a similar way to the Google tools with a few proprietary differences. 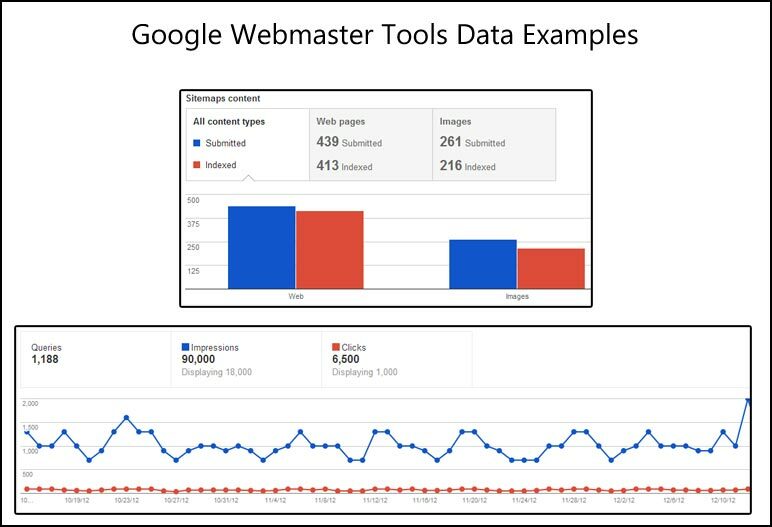 Essentially, the webmaster tools system is designed to give you a snapshot of the data that Google has managed to discover about your website so far. Making sure that the pages and content you create are being properly crawled and indexed by the search engines without any errors. The sitemaps section will give you a good idea of the overall number of pages in the Google index, but it can be hard to know exactly which pages are indexed, and which are not. Learning which of your pages are being linked to the most from external websites, and keeping an eye out for any “bad” or “spammy” websites that might be linking to you. Bear in mind that websites that link to you through an intermediary redirect will probably not show up in this list. For example, your LinkedIn profile probably has a link to your website, but that link goes to another LinkedIn page first before being redirected to your website. For that reason, at the time of writing, you probably won’t see any incoming links from LinkedIn in your webmaster tools. The ability to monitor the search queries to your website, and matching those up to the keywords you are actually trying to target. The information here is useful in learning whether or not you need to tweak the META description on a page, for example, in order to encourage a higher click through rate (CTR) in the search results. You’ll also get some idea of your average search ranking for each keyword term. Being notified by Google in the event that a hacker manages to inject malicious software into your website (this happens more frequently than you might imagine). Other warnings and notifications from Google about the indexing and ranking of your website, especially if Google notices anything strange or they feel that you’re somehow violating any of their webmaster guidelines with respect to SEO tactics. Google also offers an extensive library of help and tutorials on its website, so I would advise starting there if you need specific information on how to use the Google Webmaster Tools, since any information given here could quickly become out of date as and when Google decide to make any changes or enhancements to the system. The Google Analytics system is another of those “must have” tools, and is designed to provide you with in-depth information on exactly how your website is being used, by whom, and how effective the content is at attracting, keeping, and converting visitors. A detailed guide on how to use Google Analytics is well beyond the scope of this book, and could easily fill up a book all on its own, but here are some highlights and tips that you might find useful to know about how Google Analytics works, and some of the things you can use it for. Tracking website visitors, and further segmenting those numbers between unique visits, new visitors, returning visitors. This will give you an insight into how many people are coming back to view your content multiple times, and how well your SEO is performing in attracting new visitors. The number of pages viewed per visit and the average visit duration are both very useful guides to how engaged your website visitors are with your content. Your aim should be to increase both of these metrics over time. The bounce rate measures the percentage of visitors who landed on the site, read one page, and then left. A high number is not unusual for a blog, but for a standard website you want to get the bounce rate down as much as possible, meaning that your visitors are actually browsing the website or completing the calls to action you set out for them. The traffic sources overview tells you exactly where your website visitors are coming from, and in what numbers. You can see how many people arrived from the search engines, were referred to you from other websites, or typed your website address directly into their browser (or accessed it through a bookmark). All of this information can be expanded to drill down even further to identify keywords that brought people to your website, for example, or which pages on other sites referred the most traffic.